PROWELL PLUS© is a comprehensive workplace analytics that assesses the performance of the workplace in relation to health and wellbeing. It incorporates assessment measures that are health and wellbeing indicators in the workplace that have exhibited evidence of contributing to the organizational performance. Developed with the industry and academic partners, PROWELL©, in its essence, provides practitioners an analytic platform to assess health and wellbeing performance of the workplace that addresses a balanced approach to the triple bottom line of organizations: people, place, and profit. Most Comprehensive Key Performance Indicators (KPIs) of the Physical Workplace: PROWELL© analyzes the workplace wellbeing performance based on the most comprehensive list of key health and wellbeing indicators contributing to the workplace performance. 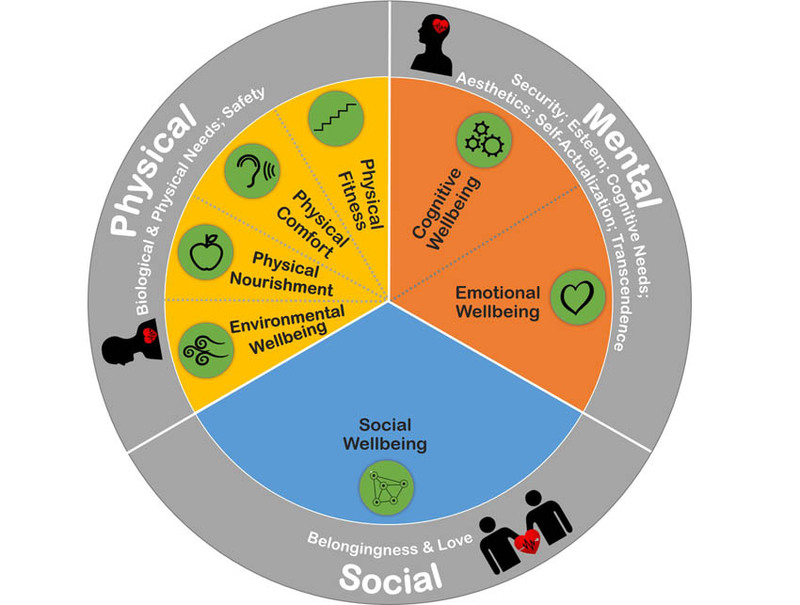 These are organized by Seven Dimensions of Workplace Wellbeing that are essential components of wellbeing examined in various disciplines, encompassing the three major domains of wellbeing: physical, mental, and social domains. 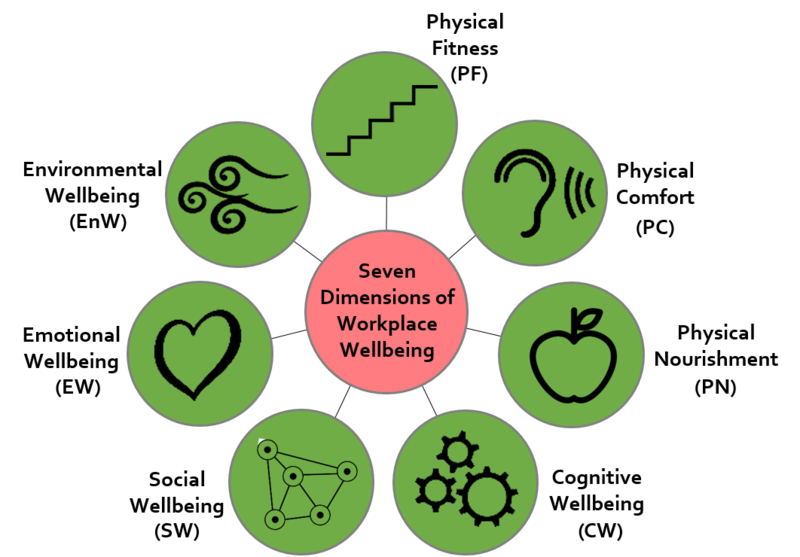 These Seven Dimensions of Workplace Wellbeing also correspond to the Maslow's Hierarchy of Human Needs: Biological & Physiological Needs; Safety Needs; Belongingness & Love Needs; Esteem Needs; Cognitive Needs; Aestetic Needs; Self-Actualization; and Self-Transcendence. Most Comprehensive Workplace Model: PROWELL© employs a comprehensive workplace model that looks at the impact of the health and wellbeing-enhanced workplace not only at the individual level but also at the oqganizational level in five positive outcomes. These include Healthy Culture, Higher Productivity, Improved Individual Health and Safety, Enhanced Reputation of the Organization, and Financial Savings. 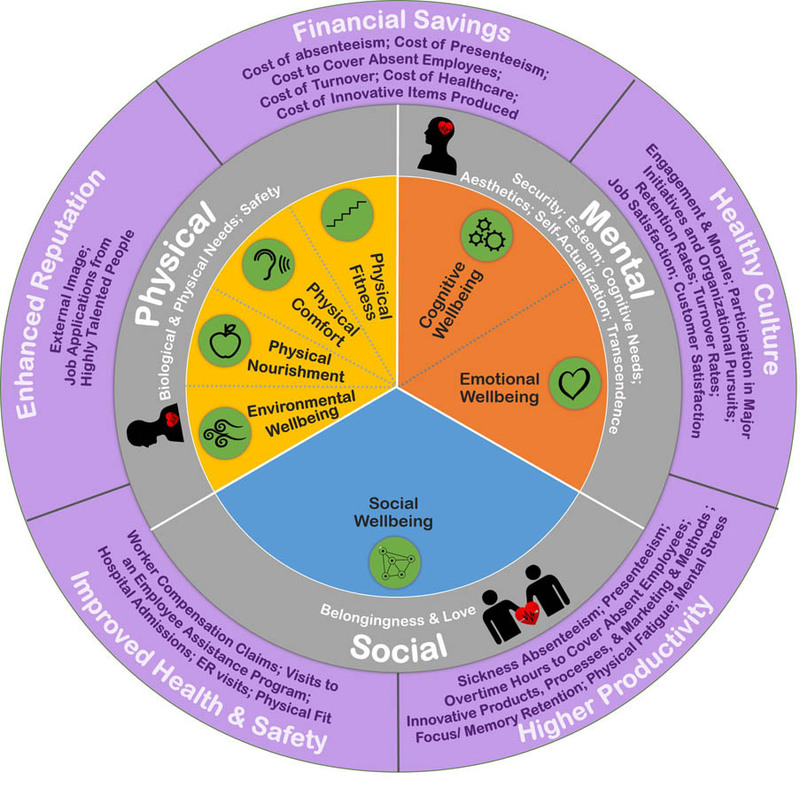 Performance-based Assessment: PROWELL© comprises a set of key performance indicators (KPIs) in each of Seven Dimensions of Workplace Wellbeing that solely utilize objective and prescriptive measures to diagnose the wellbeing performance of the workplace. 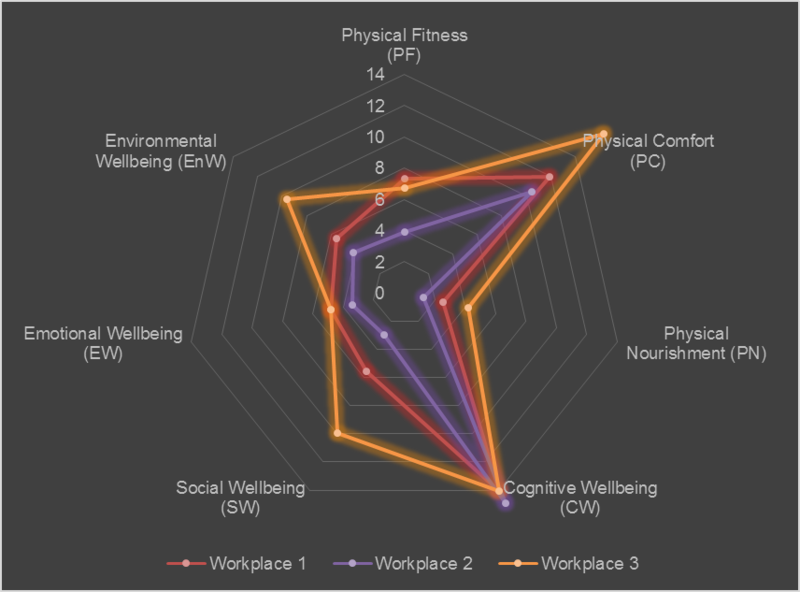 Benchmark Function: PROWELL© offers a scoring system based on a normal distribution curve that predicts the quality distribution of workplaces relevant to health and wellbeing performance. In order to accurately reflect quality differences into the tier system, PROWELL integrates a total of 6 tiers for the scoring system. This scoring system can be used as a benchmark function for companies to understand the performance of their own workplace within the tier system as well as to compare it with higher tiers. Comparative Assessment Between Multiple Projects: The "Compare" function in PROWELL© allows organizations to compare and contrast between multiple projects they manage. They can easily understand underperforming and high-performing areas of workplaces between different workplaces they manage. They can also use the "Compare" function to examine the workplace improvements between Pre and Post scenarios, or workspace changes to better align the workplace with the organizational strategies. Analytic Hierarchy Process: PROWELL© integrates the Analytic Hierarchy Process (AHP) to assess the wellbeing performance of workspaces. 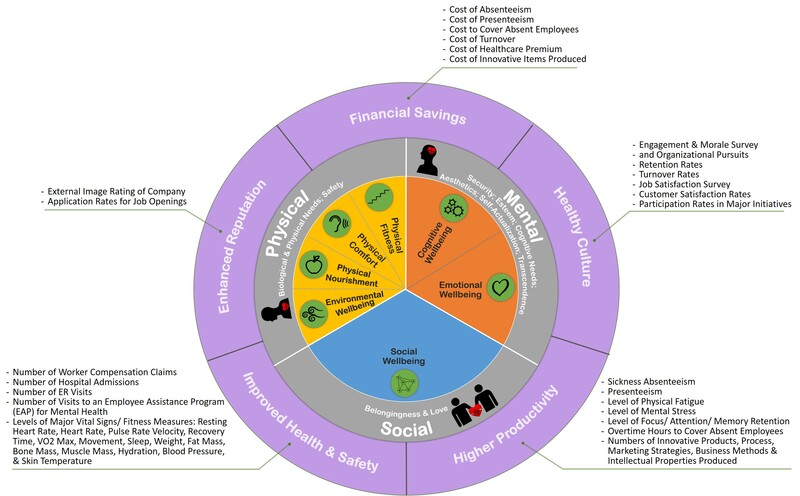 AHP is a multi-criteria decision-making technique based on mathematics and psychology to determine the priorities of intangible items. AHP is implemented to PROWELL© to offer prioritized KPIs for organizations to easily understand and target higher priorities that have the most impact for the financial and resource investment, when deciding workspace changes to better align with organizational innovation strategies. The priorities of KPIs were determined based on the concept of best solutions when considering the four most important factors when changing the workspaces: impact, money, time, and existing conditions for changes. 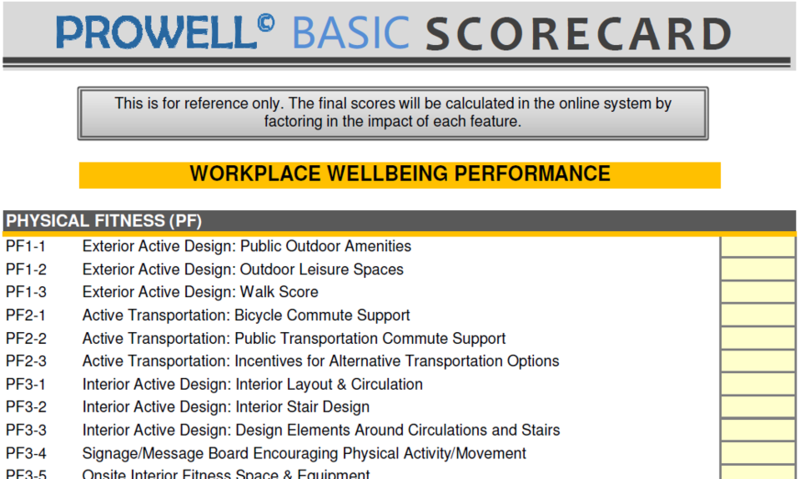 Advanced Analysis: PROWELL PLUS© further assesses the health and wellbeing performance of the workplace in relation to individual organizational performance and a set of performance measures in five major outcomes of health & wellbeing-enhanced workplaces. It offers an advanced analysis for strengths and opportunities of the workplace features that can contribute to further enhanced organizational performance based on the assessment. Prioritized Recommendations: PROWELL PLUS© analyzes and provide a set of customized recommendations for each organization that are calculated by a formula taking into account priorities specific to the organization. This calculation was developed by applying a combination of the calculation of ranking via the Analytic Hierarchy Process (descriptions below) as well as the frequency ranking calculation developed by IWI.